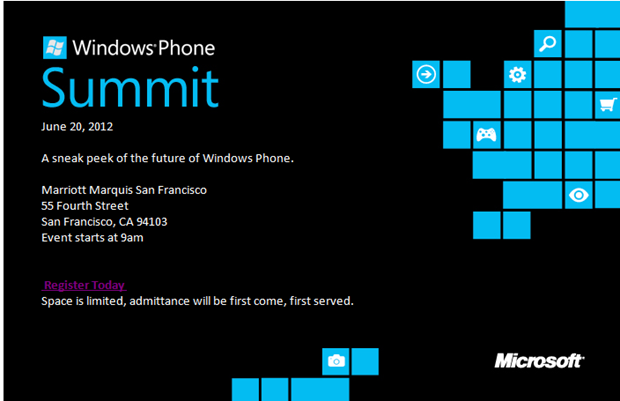 Microsoft will show Windows Phone 8, the next version of its mobile operating system, during an event to be held on June 20 -- a date which conveniently falls between Apple's WWDC 2012 and Google I/O. At the moment, the future of Windows Phone as we know it is Windows Phone 8, or Apollo as it’s also known. Leaked details on Apollo indicate the OS has been completely rewritten, improving on many of the strict hardware restrictions Microsoft imposed on early Windows Phones. This could include support for higher screen resolutions, dual-core and possibly quad-core processors, user-expandable memory and NFC. Additionally, Skype may be integrated into the OS, and Windows Phone 8 could bring about the demise of Microsoft’s Zune software. As well as introducing the OS, Microsoft could also put existing Windows Phone owners out of their misery, by telling them whether Apollo will be compatible with devices running Mango or not. Reports have varied so far, with some saying yes, and others saying a very emphatic no. With the mobile industry emphasizing software enhancements as much — if not more — than hardware innovation recently, the opportunity to see the three major players’ future plans in the same month is excellent news for consumers. By the end of this month, anyone planning on purchasing a new phone later this year, or switching to a new ecosystem, could potentially make an informed choice on the spot. It’s a bold move on Microsoft’s part to park itself right in the middle of its competitors big events, and shows how serious it is about turning its low market share around. It’s a completely different approach to Samsung, who avoided the press blitz associated with Mobile World Congress, and instead launched the Galaxy S3 at a solo event several months after. Chances are it’s not just going to be the schedules of these preview events that coincide either. A new iPhone could arrive around September or October, Google has been rumored to open its new online store around October or November, and when’s the expected release of both Windows 8 and Windows Phone 8? Yep, September or October. The latter half of 2012 is looking very exciting indeed.